UC San Diego Health hackathon draws competitors from across U.S., from October 6-7. On Saturday, October 6, hundreds of hackers are expected to descend upon the University of California San Diego campus to put their collaborative problem-solving capabilities to the test. The fast-paced, two-day event brings together interdisciplinary teams to identify and solve some of today’s most pressing health challenges, such as antibiotic resistance, opioid abuse and management of mental illness. Health Hack participants bring ideas to life with prototyping software, hardware supplies and application programming interfaces. Under the guidance of mentors and field experts, projects are created from scratch and presented to judges in an expo. Finalists move on to a panel of experts who select the winning teams. Cash prizes for this year's Health Hack are $5,000 for first place, $2,000 for second place and $1,000 for third. The Health Hack is open to the public. Students and professionals with engineering, medical and entrepreneurial backgrounds are encouraged to apply. Teams vary in size and can be formed in advance or at the event. 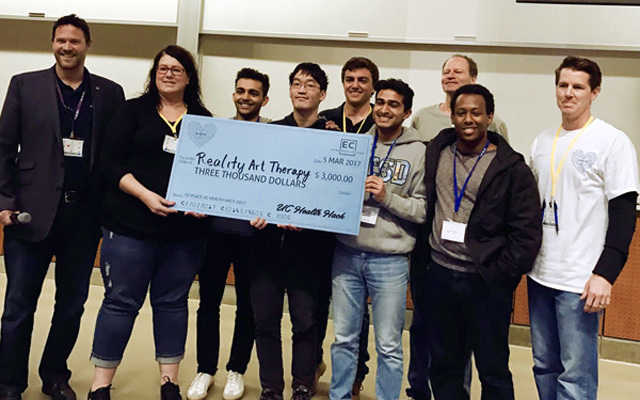 The winner of last year’s Health Hack project was called, “Off the Wall: Reality Art Therapy,” created by a team led by Benyam Alemu, age 22, an entrepreneur and biochemistry student from UC San Diego. The multi-faceted program uses technology, art, hospital gardens and staff education to get patients out of their beds, empowers nurses to help without increasing their workload and enlists caregivers to support their loved ones. Shortly after the Health Hack, Alemu commercialized the hackathon project and launched a company called Theravision Health Informatics and serves as the company’s CEO. UC Health Hack is hosted by UC San Diego Health and members of the University of California’s health systems. Sponsors of the event are Amazon Web Services, Optimum Healthcare IT and Jamf.